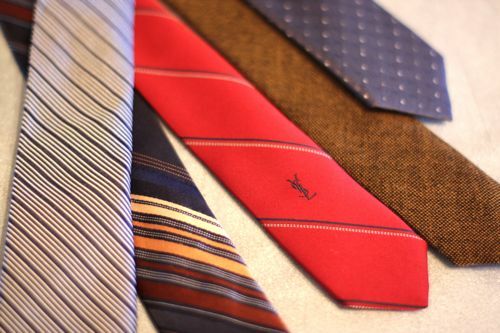 But Gabrielle's son, Ralph, liked skinny ties, but she said they are surprisingly hard to find — either too long or too expensive for a 13-year-old’s wardrobe. So she bought a whole bunch of regular sized ties at the thrift store for only $1 each. Unfortunately, the tailor said it would be $37 A PIECE to make them skinny. Pretty unbelievable, right. So, being the crafty mom that she is, she decided to do them herself. Her tutorial is posted on her blog here. If you have a boy that likes to look hip give this little tut a try. And hey, if you have a hip husband this tutorial would probably work for larger ties too. That's a pretty good idea - might try it one day. Anyway, I saw your Queen of Hearts costumes on hgtv.com. It's still stunning. Great idea, will give it a go for myself. I like wearing skinny ties with a shirt and sleeveless dress sometimes.